Puerto Rico Still needs your help! Puerto Rico still needs our help! Thats why this Saturday we are gathering over Rice & Beans! Anyone is encouraged to bring a pan of their style of rice and beans to add to the buffet. 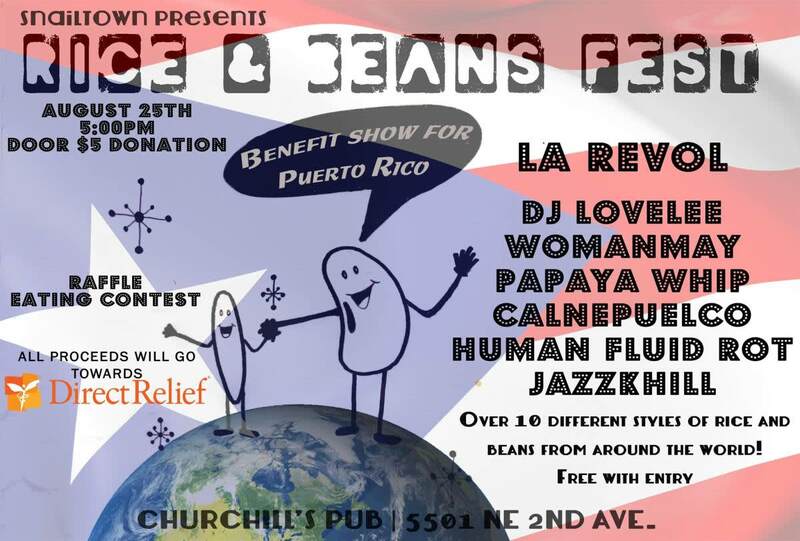 $5 entry or more added donation gets you all you can eat rice and beans and a raffle ticket to win artworks by three different artists! Direct Relief will aid in getting these funds to the most needed areas of Puerto Rico. https://larevol.com If cannot attend and wish to donate, please follow the link below. We really appreciate your support! Saturday August 25th, 5p-5a at Churchills!